All car seat manufacturers recommend that an infant’s shoulders be even with or slightly above the lower shoulder harness slots. However, most car seats have harness systems that will not fit snugly at the hips of smaller infants and will not hold a small baby so that its shoulders are at the recommended height. Without a close and snug fit, a small infant can slide down in the seat and slump to the side, creating an increased potential for injury. This is most likely for the smallest and medically fragile infants. The Wallaby offers the easiest way to reduce these risks. It provides lateral stability, prevents sliding/slouching, maintains the harness straps in the correct and safe position and keeps a baby’s shoulders level with the harness slots. 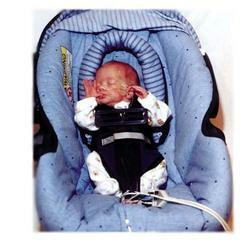 It is ideally suited for stabilizing infants with tracheostomies, gastrostomies or monitoring cords. Provides lateral stability, prevents sliding/slouching, maintains the harness straps in the correct and safe position and keeps the infant's shoulders level with the harness slots. Designed for the smallest and medically fragile infants. It is ideally suited for stabilizing infants with tracheostomies, gastrostomies, or monitoring devices.